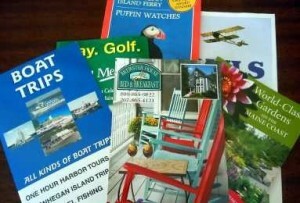 Are you getting ready to plan your Maine vacation, but dreading the planning process? Take the pain out of the process by using these timely shortcuts for a great vacation, planned in record time! 1. Plan Where You Want to Spend Your Time. Maine is more than the Maine coast, and more than its mountains. There are eight distinct tourism regions, from the beaches in the south to the sparsely populated area in the north. They are described briefly in the Regions page at the State of Maine’s official tourism site.Our blog has an article with more details for each one in our guide to a Maine vacation, “Visit Maine Like A Mainer.” Some will want to tour all (or at least most) of the regions, while others prefer to find a region or two that they love, and spend their Maine vacation in those areas. 2. Decide When You Want to Visit Maine. For a quick overview, the Seasons page from the Visit Maine site will provide basic information on seasons, and some activities that are particular to a season.The most popular time in most areas of Maine is the summer and Autumn (July through October). The weather is generally warmer, temperatures are mild for the most part (though most years see a week or two when we are happy to have air conditioners in our guest rooms). Later Spring can also bring Summer-like weather, with fewer visitors. Fall is the foliage season, of course, and is a very popular time to visit. In the mountains, Winter is very popular with downhill skiers, and cross-country skiers will find great locations throughout the state. If you plan to visit the Maine coast, to see lighthouses, visit Maine’s beaches or rocky coastline, you’ll want the latest information on the nearest lighthouse, the best beaches for your style of vacation, or the best locations along the Maine coast for photography. The very easiest way to find out where to go is to stay at the perfect alternative to a traditional Maine hotel — to stay in a Maine bed and breakfast, such as our Freeport Maine bed & breakfast. Your B&B innkeepers will be able to give you the information you need to find just the kind of activities that will suit your interests. Many bed and breakfasts will offer vacation packages, specials or tours to help you with your planning. For example, at Brewster House we offer several packages throughout the year, as well as seasonal specials, a Lighthouse Tour package and a Fall Foliage Tour package. If you take advantage of these specials and packages, you not only save money (there is even a small savings in the busy summer season), but you’ll have several activities pre-planned, so your Maine vacation will have plenty of opportunity to see things that many visitors miss, and you won’t have to spend your valuable vacation time wondering what to do next. For some, the uniqueness of Maine is the opportunity to visit the rocky Maine coast. For others, it is to see moose during their Maine vacation. Still others want to visit as many of Maine’s lobster shacks as possible.Whatever your interests, be sure you do a bit of homework (search the web, contact the innkeepers at your B&B, visit the VisitMaine website, etc.) to be sure you will be able to see the things that will make your Maine vacation a memorable one. So what are you waiting for? Start planning your Maine vacation!